An Arduino keypad shield for using a 16-key matrix keypad with your Arduino sketches. Mounted remotely. Sometimes, the Arduino and Keypad may be separated—for example, you may want to mount the keypad on the front of a box or next to a door and keep the Arduino itself somewhere nearby. 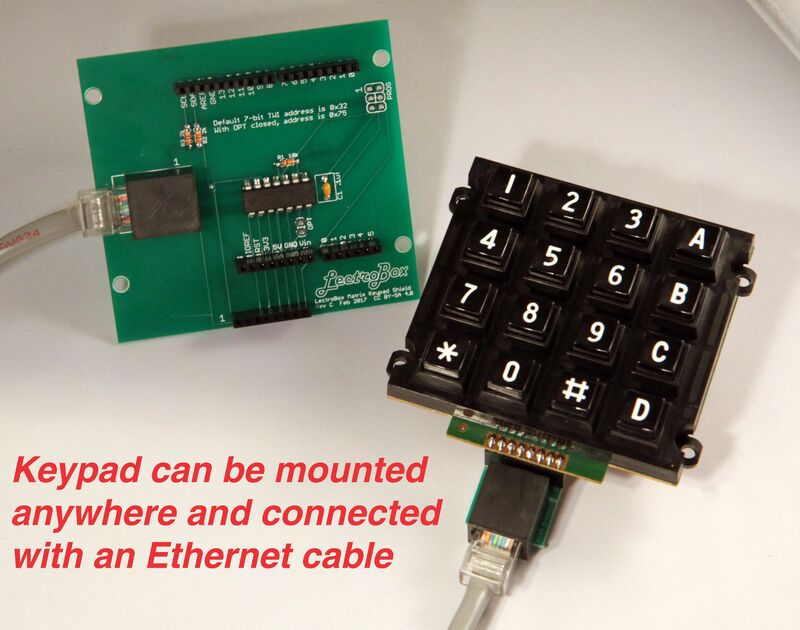 In this case, attach the included RJ45 dongle to the keypad and connect the keypad to the shield's onboard RJ45 jack with any Ethernet cable. 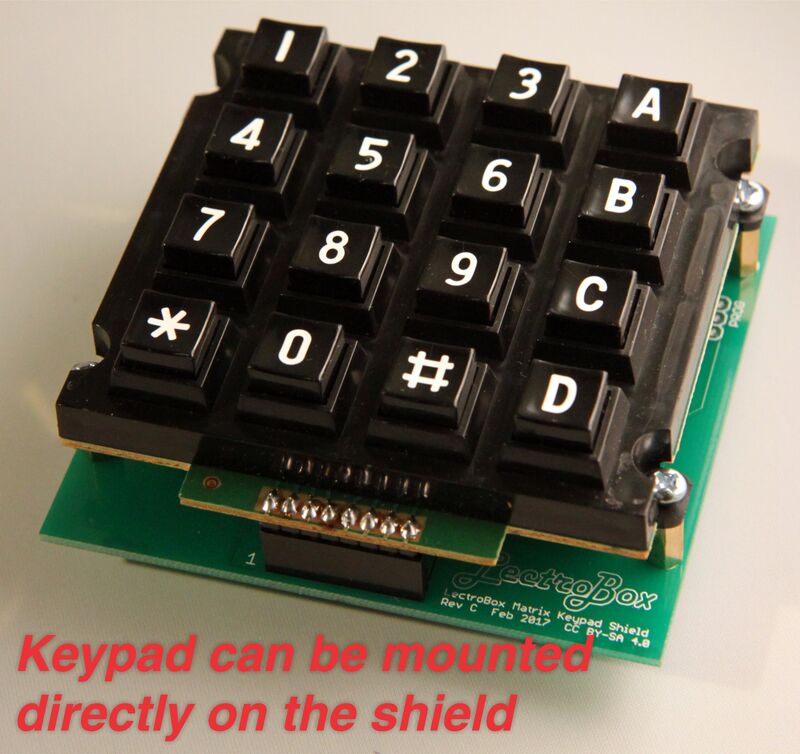 You can buy standalone keypads and attach them directly to an Arduino without a shield, of course. But that usually results in a big mess of wires and a keypad dangling from the Arduino. Also, directly attaching a keypad consumes 8 or more pins on your Arduino -- leaving precious few for other uses. Just plug it in! All the mounting hardware is included. In your sketch, just link our Arduino library, and call getNextKeypress() to get each keypress. This is just the list of Arduinos that I've personally tested the shield with, but it's likely to work on many others, too. The Arduino library, including an example sketch, can be installed using the Arduino's Library Manager (search for "Lectrobox Keypad"), or downloaded here. To access the keypad from your sketches, first install the library. The easiest way is to use the Arduino's Library Manager; select Sketch > Include Library > Manage Libraries... and search for Lectrobox Keypad. You can also install it without the library manager by downloading the .ZIP manually and selecting Sketch > Include Library > Add .ZIP Library.... For detailed instructions, check out the Arduino Library tutorial. To poll for keypresses, call keypad.getNextKeypress(). The return value will be 0 if no key has been pressed, or the character that was pressed if there was one. Possible key values are the characters '0' through '9', lowercase 'a' through 'd', 's' for star, or 'p' for pound/hash. Note that when digit keys are pressed, the return values are the ASCII characters '0' through '9' (i.e., decimal values 48 through 57), not the numbers 0 through 9. For maximum compatibility with other shields, the Lectrobox Keypad Shield lets you choose between two different hard-coded TWI slave addresses. The default 7-bit address is 0x32. The alternate address is 0x75, which can be selected by soldering a jumper between the two shield pads marked OPT and power-cycling the shield. After the hardware has been reconfigured, the software library must also be configured to query the new TWI address. In your sketch's setup(), initialize the KeypadShield library by calling keypad.begin(0x75).